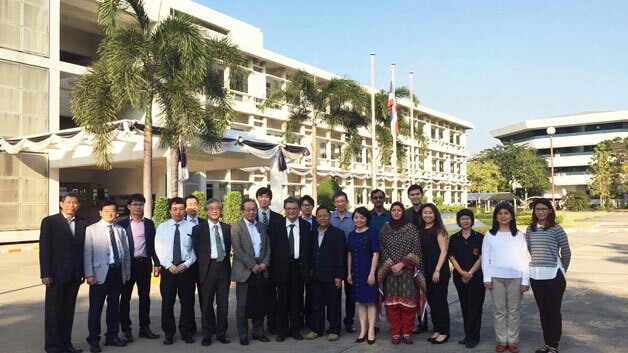 On 2 and 3 February, UNU-IAS led a session of the Pure and Applied Chemistry International Conference 2017 (PACCON 2017), organized by the Chemical Society of Thailand under the Patronage of Her Royal Highness Princess Chulabhorn Mahidol at King Mongkut’s University of Technology North Bangkok (KMUTNB). Her Royal Highness, a trained scientist herself, presided over the opening ceremony. Kazuhiko Takemoto, UNU-IAS Director, opened the session and gave a presentation entitled “The Strategic Approach of UNU-IAS towards a Sustainable Global Future”. Researcher Mario Tabucanon presented on the science-policy interface for implementing the 2030 Agenda for Sustainable Development, specifically focusing on the case of the UNU-IAS Monitoring and Management of Persistent Organic Pollutants in Asia project. Yasuyuki Shibata of the Japan National Institute for Environmental Studies explained the relationship between the Stockholm Convention and the Global Monitoring Plan (GMP), which is designed to cover all environmental monitoring worldwide in order to assess the effectiveness of the Convention. Through his presentation, Shibata provided a brief outline of GMP activity and how the project contributes to it. Masatoshi Morita of Ehime University further elaborated on details of the project, with Tetsuo Iida of Shimadzu Corporation speaking in more technical terms about the methods used to enable the project participants to analyze perfluorinated compounds (PFCs) in surface water, sediment, and biota samples. In the second part of the UNU-IAS session, the representatives of the project-participating countries–namely India, Indonesia, the Republic of Korea, Singapore, Malaysia, Pakistan, the Philippines, Thailand and Vietnam–presented the outcomes of their 2016 project activities. Each representative reported on the level of PFC contamination found based on the results of their monitoring as well as how these data have contributed to decision-making processes in local, national, regional, and global contexts.